When I was a young child living in Germany, I excitedly anticipated the latest magazines and news from America — I somewhat obsessively poured over advertisements and articles on new movies, video games, and the like. In reading these little snippits of culture, I always felt as if I was simultaneously connected and not connected to American culture. I was the recipient of culture at the end of a gigantic telephone game, receiving only brief compartmentalized packets of culture in brief bursts. In my distance I created my own sort of understanding of American culture, which was “wrong” in the traditional sense, but nonetheless wonderful in its own way. 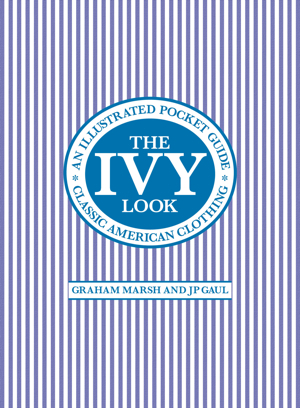 This is the kind of sartorial understanding I attribute to Graham Marsh and J.P. Gaul’s The Ivy Look: Classic American Clothing- An Illustrated Pocket Guide, a new book from London about the “Ivy look” as the English authors saw it. The Ivy Look is not about the American experience of the Ivy League look — rather, it is about the English interpretation thereof, and how smatterings of imported American culture (specifically jazz and cinema) crafted that interpretation. Ultimately, while the book seems to place unusual precedent on arbitrary parts of the Ivy League style, it does so in such a refreshing way that the book becomes respectable in its own right. The Ivy Look is, in one sense, a nostalgic look back at the 1950s and 60s world of Ivy style specifically as it was presented in American culture. The book focuses predominantly on jazz album covers and advertisements with sparse text intertwined, reconstructing within its pages a preppy world of jazz, Bass Weejun loafers, tweed sport coats, and button-down collars. In this veritable religion, Miles Davis, John F. Kennedy and Anthony Perkins are saints, and the wood-paneled stores of J.Press and Brooks are their temples. One can almost smell the smell of old books and cologne off the pages as Graham Marsh and J.P. Gaul describe their own interpretations of the world of the preppy. 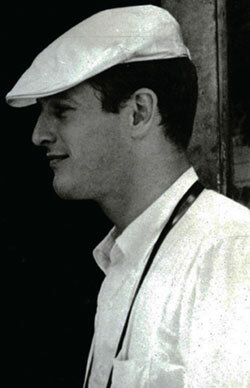 "The Ivy Look" is all about flat caps and the traditional indices of 50s prep. The Ivy Look is, in another sense, a love letter sent by England to a period of American style. The British “Ivy look”, as the book constructs it, is a wonderful world of well tailored suits, beat-up khakis, Sperrys, Levis and Converse, Lacoste polos and desert boots, and everything else that exudes preppy stylishness, where even a “Made in the USA” label excites the buyer. The ads in the book are of the kind that one regularly sees displayed by Brooks Brothers or J.Crew: they are vestigial remains of idealized WASP-y 50s culture, now dead but not forgotten. You can tell that the authors of the book genuinely adore what they write about, and it’s positively addictive. The Ivy Look is the kind of book that makes you want to time warp back into the 50s, enroll in an Ivy, buy out the entire stock of Brooks Brothers, and spend your time being casually cool in a wholly useless major. Ironically, The Ivy Look‘s biggest flaw is also its most endearing feature. The Ivy Look, as its name may imply, is not about the Ivy League look as much as it is about the “Ivy look”, an offshoot movement that emerged in Britain and Europe generally. The “Ivy look” is about foreign fascination with American styling — it is about those who went from Seville Row tailoring to the sack suit and what encouraged them to do so. To purists looking for traditional America-centric discussion of Ivy League style, The Ivy Look is utter heresy. A sartorially pedantic cynic would grind their teeth as the book dotes upon Jazz culture, focuses far too heavily on movies and album covers for direction, and, perhaps most offensively, seems to happily conflate Ivy League style with other styles with reckless abandon. Nonetheless, there is something youthful and interesting about The Ivy Look. The book has a joyous love for what it discusses, even if the book addresses the topic from an ocean away. Like the clubs of preppy Japanese men in the 1960s that comprised the “Ivyquake”, The Ivy Look‘s new perspective on the uber-prep is a refreshingly new vantage point. Old and somewhat antiquated styles of the 1950s and 1960s feel new and remarkably fresh in the hands of Messrs. Marsh and Gaul, even if their view is from the perspective of an island far, far away from the nearest J.Press. Ultimately, The Ivy Look is the kind of book that is both a nostalgia trip and (hopefully) a view of things to come. On one hand, The Ivy Look is all about a small cultural movement in Britain that was entranced by 50s-60s American style and culture. On the other hand, The Ivy Look is part of a great revival of the Ivy League look itself, a sort of foreshadowing of things to come. As the sartorial ennui of the ’90s and ’00s is slowly dying off and as companies like Brooks Brothers, J.Crew and Ralph Lauren become ever more pervasive, the power of the Ivy style grows. One can only hope that one day very soon the ratty t-shirt will be replaced with the masculine button-down, and that The Ivy Look ceases to become nostalgic and rather becomes trend-setting. 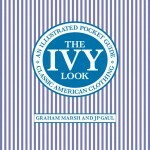 Images provided by Frances Lincoln, from the book The Ivy Look: Classic American Clothing- An Illustrated Pocket Guide by Graham Marsh and J.P. Gaul. Available to browse on Google Books and to purchase at Amazon.com and Barnes & Noble for $14.